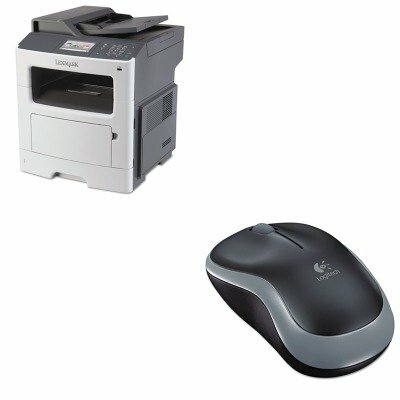 lt;stronggt;LEX35S5701lt;/stronggt;lt;BR/gt;Lexmark MX410de Multifunction Laser Printerlt;BR/gt;Increase your office's efficiency and productivity with this multifunction laser printers upgradable memory, dual-core processor and built-in Gigabit Ethernet. Simplify basic functions and key workflow processes with easy-to-identify icons on the 4.3 customizable color touch screen. Print without a PC using the convenient USB port that lets you walk up, preview and print PDFs, plus many other file formats. Print Technology: Laser Maximum Print Speed Black: 40 ppmNetwork Ready: Yes.lt;BR/gt;lt;BR/gt;lt;stronggt;LOG910002225lt;/stronggt;lt;BR/gt;Lexmark MX410de Multifunction Laser Printerlt;BR/gt;Simple and reliable mouse is contoured for comfort. Features 2.4GHz wireless technology with virtually no delays or dropouts. The on/off switch and smart sleep mode help the battery last up to one year. Nano receiver stays in your USB port for safe-keeping. Connector/Port/Interface: Nano Receiver Left/Right Hand Use: Left/Right.